Matt Spina, an IDOT Minuteman for 10 years, has been faced with many dangerous situations while on the job. At 1:48 a.m. on Tuesday, May 31, IDOT Minuteman Matt Spina was responding to a crash when a drunk driver on the Dan Ryan expressway slammed into his truck. 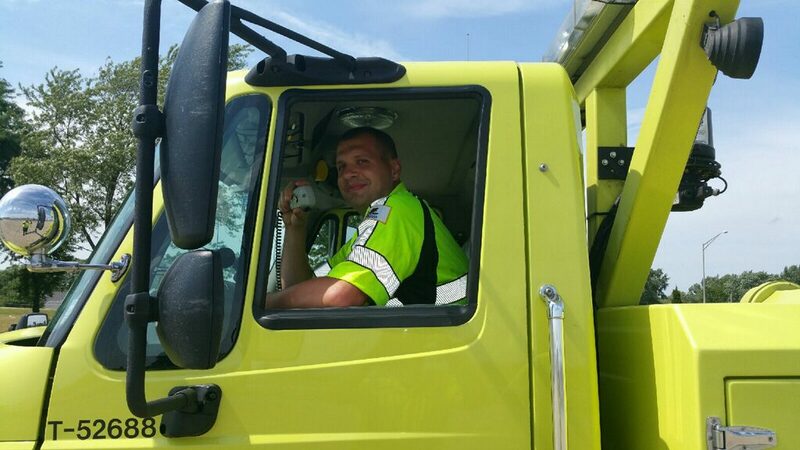 Matt, who has been an Emergency Traffic Patrol (ETP, also known as Minutemen) for 10 years, works the nightshift and had just responded to a crash at 59th Street on the Dan Ryan. He was just heading out when his supervisor called him about another crash at 47th Street. When Matt arrived on the scene, he saw the empty cars close to the shoulder and the passengers were walking around close by with no injuries. He dropped flares around the curved exit at 47th Street and got back into his truck to move behind the car. Within moments, a car going 80 miles per hour plowed into the back of Matt’s truck, sending it forward about 15 feet. He was instantly dazed, and felt a dull pain starting to spread from his neck to his back. When he looked in his rearview mirror, all he could see was flames erupting from the car that just hit him. Taking quick action, Matt got to the burning car and attempted to pry open the door. All he could hear was screaming and knew the people inside were hurt and afraid. Matt’s supervisor also came to assist him with the accident and the two worked together to pull the driver and the passenger out through the car windows and placed them on the shoulder. The fire department arrived shortly after and extinguished the burning car. After the quick rescue, Matt had a chance to sit down and collect himself. “That’s when the pain really started to set in,” said Matt. He went to the hospital around 2:15 a.m. and got out at 9 a.m. after a round of x-rays, a CAT scan and blood tests. Though he was lucky to walk away without major injury, Matt suffered a bad neck and back strain from the impact and has been off of work since the accident happened as directed by his doctor. The woman that plowed into Matt had been arrested for her second DUI and was two and a half times over the legal limit at the time of the accident. Both her and the other passenger survived the accident, most likely due to the quick response of Matt and his supervisor. “I know the situation could have been a lot worse for everyone,” said Matt. Matt is no stranger to being vulnerable while on the job. Last year on St. Patrick’s Day, he was helping out a stranded motorist when the same thing happened – a drunk driver plowed right into his truck. Luckily, the damage was minimal and no one was seriously hurt. That was the fourth time Matt had been rear ended while working, and he suffered other minor injuries during countless other incidents that were due to stopped vehicles and distracted drivers.